According to legend, tequila was discovered when a bolt of lightning struck a crop of agaves, causing a fire that released a honey that caught the attention of the native people. Fermented, the honey had both relaxing powers and could incite euphoria. The indigenous people considered this drink to be an elixir of the gods. Te’Kila, Sherman Oaks celebrates this spirit that carries a mythical past. In 2016, the valley outpost of Te’Kila took over the legendary Stanley’s on Ventura Boulevard. With over 150 varieties of tequila and mezcal, as well as an inspired cocktail menu, Te’Kila is a great place to meet friends for after work or late night drinks. The restaurant is generous with happy hours, Monday through Friday, 3-7 pm, all day Sunday, and late nights, Monday through Thursday, 10 pm – 12 am. But there’s much more. The menu at Te’Kila is classic SoCal Mexican with a healthy twist, plenty of dishes that are amenable for vegetarians, as well as carnivores. Many of the dishes are centered around the kitchen’s housemade corn tortillas, prepared with yellow, blue, or white corn. There’s definitely a neighborhood appeal to Te’Kila. It’s the kind of place with regulars but always welcoming to newcomers. In Los Angeles tradition, there’s a Sunday brunch with dishes like chilaquiles and posole. Four days a week, the restaurant offers specials. There’s Margarita Mondays; Taco Tuesdays; and Fajita Thursdays, as well as Sunday Funday. The restaurant and its lounge, Rita’s, host special events, tequila tastings, live music, comedy nights and more. Details are available on the Rita’s Instagram. The Te’kila Margarita: Fresh lime juice, agave nectar, 100% blue agave tequila blanco, premium Triple Sec. Add fresh fruit for a surcharge. Also available as a pitcher or gigante. Burritos with refried beans, spanish rice, pico de gallo, sour cream, guacamole, roasted jalapeno. Add chicken, steak, shrimp, grilled salmon or vegan chicken. The Modern Vietnamese icon Crustacean is launching a three-course Executive Lunch ($35) that highlights its Asian fusion classics. The Beverly Hills restaurant has recently returned after a remodel, which includes several floating walls that can be shifted to accommodate private meetings. So now, you can join agents and studio executives, ladies who lunch, and deal makers for an elegant lunch in the heart of Beverly Hills. The chefs of Annie’s Edibles have brought The Sunday Soul Food Pop Up to Fairfax’s Little Ethiopia from 11:30 am to 6 pm weekly. The LA-based catering company is a favorite of clients ranging from the NFL Network and Nike to TMZ. Since the pop-up is family owned and operated, you might even see Johnson’s 11-year old son chatting up guests and refilling glasses of strawberry lemonade. Other beverage options include purple rain punch. What’s on the menu? As they say in the South, “meat and three sides” — classics like shrimp and grits or oxtails and gravy to updated twists like habanero fried chicken and short rib french fries. Each entree comes with — you got it — 3 sides, which include mac & cheese, candied yams, cornbread dressing, greens with smoked turkey, black-eyed peas, or red beans with smoked meat. Each meal comes with complimentary cornbread and whipped butter. And, of course, there’s dessert! Top off your Sunday meal with OMG banana pudding or peach cobbler. The pop up takes place every Sunday from 11:30 AM to 6 PM at 1066 S Fairfax Ave, Los Angeles, CA 90019. A self-taught pizzaiolo, Chef Darin has created pizzas that highlight seasonal ingredients like squash. Fernando grew up in the Brazilian countryside with his Brazilian family where his first exposure to a wood-fired oven was at his grandmother’s house. Years later, his wood-fired pizzas, both seasonal creations and signature year-round classics, have become the most popular item on the Ray’s and Stark Bar menu. Try the Roasted Squash pizza with black truffle bechamel, fior di late, carmelized onion, and San Giacomo balsamic. It’s a definite winner. Along with the Roasted Squash pizza, Darin’s newest seasonal creations include ALCI with San Marzano tomatoes, anchovy, garlic, black olives, pickled onion, and olive oil; and CAVOLO NERO with black kale, spinach, burrata, garlic, and Calabrian chiles. Enjoy a Pinot or one of Stark Bar’s signature cocktails with a pizza or two this weekend! LA’s Michelin-starred Patina is hosting a very special dinner November 9. According to truffle experts, this year’s white truffles are superb, due to ideal rainfall in Alba, Italy. And Patina’s Executive Chef Andreas Roller is thrilled to host the unforgettable dinner dedicated to this “culinary diamond”. The not-to-be-missed six-course dinner will begin at 7 pm and feature not only white truffles but customized wine pairings. The menu includes both savory and sweet dishes, from California Spiny Lobster to White Chocolate Cremeaux. In addition to the White Truffle Dinner, Patina will be offering a white truffle add-on to various dishes throughout the season. Photo Credit, Ghost Media, Inc.
Tickets are $400 per person, including custom wine pairings for each dish. Reservations can be made online. Lauren McKinley first met Christopher Bornstein through a friend when she was on vacation in Hawaii in 2014. The two hit it off and started a long distance relationship. Lauren moved to the Big Island on a whim and soon after, the Spicy Ninjas were born. S.N.S. OG – Three Wrongs Make a Right! Sauce features organic carrots,ghost chili, Hawaiian chili, Datil chili,and Hawaiian Akua chili, which the Spicy Ninjas say goes with everything from a gourmet stir-fry, popcorn, or a margarita rim. Chris says one of the couple’s goals is to boost organic farming on The Big Island. “The state of Hawaii imports 90% of its food and it doesn’t have to be that way. We need to protect our oceans and wildlife here,” he says. Today, Spicy Ninja Sauces are available in Foodland, Hawaii’s largest grocery store, health food stores on the island, and are also used as wing sauce at Kona Brewing company, as well as in other island restaurants, as well as on the Spicy Nina Sauce Website. In addition to the O.G. sauce, the line includes whimsical sauces such as God Fearing Monkeys in the Temple of Sweet Chili Bang Bangs, a Thai-inspired sauce with local organic lemongrass, ginger, ghost and Hawaiian chili, bananas, and dried jackfruit; Mauna Kea Magma with organic local coffee and beets; T-Rex similar to Magma but with turmeric; God Fearing Monkeys in Bob’s Disco Inferno with banana, poi (taro root) and raw cacao; Super Typhoon and the Pina Colada of DOOM with cast iron-toasted coconut and Hawaiian pineapple, Biblical Burn with organic sweet potato, burdock root, cardamon, frankincense and myrrh, spiced with yellow Peruvian chili; God Fearing Monkeys and the Bengali Spice Pirates – Calypso’s Full Tilt Boogey with chocolate habaneros; Mapaches Voladores y el Ejército de los Fantasmas Verdes! (Flying Raccoons and the Army of the Green Ghosts!)) with tomatillos, Green Ghost and other chilis; and Tiger Claw Lee’s Smooth Groove Releases the Kraken! with organic soursop, nettle leaf, jasmine tea, sarsaparilla, and a host of peppers. VERY HOT – Advanced Tactical Weaponized Starfruit Darth Star O.G. ; VERY HOT – Cupid’s Rock n’Roll will Never Die! A Spicy Ninja Love Ballad V 3.1 with ghost chillies, dried habaneros and dried ghosts, damiana, toasted black sesame, ashwaganda, maca root, cinnamon and raw cacao pods; Flaming Piña Hopocalypse! ; “Pussyfootin’ Around” Bengali Spice Pirates with banana and papaya; ‘Pussyfootin’ Around’ Piña Colada – Revenge of The Happy Chinchilla! ; and Tipsy Coco Mango Madness. Just in time for Pumpkin Spice season is Drunkin’ Pumpkin with kabocha squash and Koaloa Spiced Rum. “Spicy Ninja has really taken off with mixologists,” the couple notes. “Heat has found its way even into companies that make sriracha or habanero beer, as well as spicy vodkas. Adding hot sauce to rims is a thing. When we are at Lava Beach Club, we get mai tais with hot sauce for a spicy mai tai. It’s also good in a Bloody Mary. Mauna Kea Copper Bar uses our sauces and PAU Vodka in Maui does a whole series with vodka, a mixer thing. Craft Brew Alliance sells the sauces in its gift shops, including an airport location. It’s huge! Large scale farming doesn’t vibe with the couple’s philosophies. “We don’t agree with it, especially on an island like we are. What goes into the ground goes into the ocean. Reefs die off. We blame it on sunscreen but it’s also chemical fertilizers that end up in the ocean,” explains Chris. As a result, the couple has created their own growing methods. They are becoming more complex with what they do and are getting ready to build their first manufacturing facility. Lauren says she and Chris come from two different backgrounds with different spice tolerances. She grew up in New England with parents who “didn’t even do onions and garlic” and had to build up her spice tolerance. “I have always been appreciative of food and worked in restaurants and the food industry. I enjoy cooking but would happily have someone else cook for me!” She enjoys coming up with different flavor ideas. “We’ve done our research. Salsa is replacing ketchup and is now America’s number one condiment. We’ve been in business 3 years and seen heat tolerance building up and up. We have no trouble impressing some of the big hot sauce fanatics who like high heat,” says Chris. “We’re also covering lot of people who don’t normally like hot sauce but are surprised by the flavors. It’s not peppers and vinegar,” adds Lauren. Los Angeles foodies, wine lovers, and cocktail enthusiasts will gather next Saturday, September 8 to eat, drink, and raise money to support pediatric cancer and support. 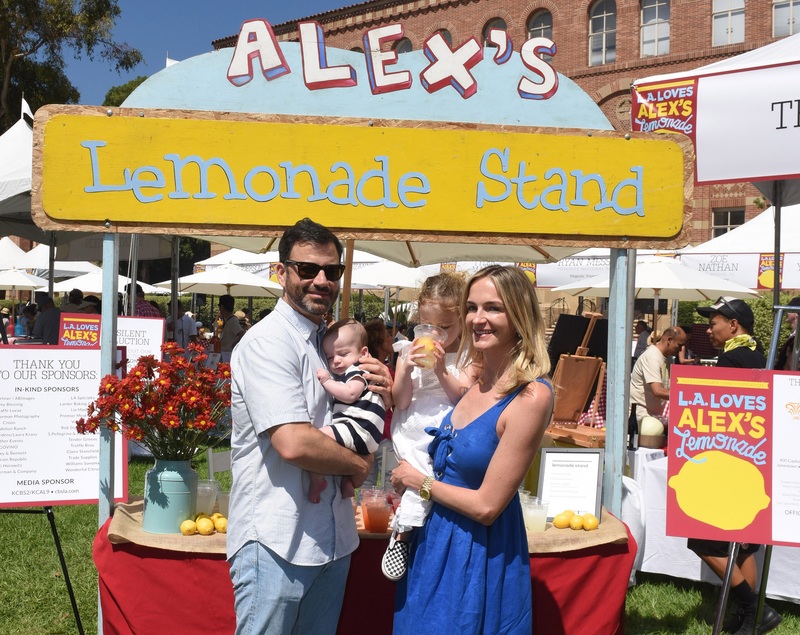 At the annual LA Loves Alex’s Lemonade, to be held at UCLA’s Royce Hall Quad. The event has raised over $5.8 million to fund childhood cancer research and support services. Last year’s event raised over $1.3 million. The event also features a live and silent auction you won’t want to miss. Chef Suzanne Goin and business partner Caroline Styne (Lucques, a.o.c., Tavern, 2018 Hollywood Bowl), along with Chef David Lenz (The Hungry Cat) host the special afternoon that features chefs and mixologists from SoCal and beyond. General admission tickets are $195/each with children 12 and under admitted free. Purchase tickets online and check-in at the event. The event takes place at Royce Quad (also known as Dickson Court on Google Maps) located on UCLA’s campus. The address is 375 Portola Plaza, Los Angeles, CA 90095. Parking is available for $12 per car. All guests will park in Lot 2. To get to Lot 2 from the 405, take the Sunset Blvd. exit east (towards UCLA). After you pass the UCLA campus on your right, turn right onto Hilgard Ave. From there, make a right turn onto Westholme Ave. Make an immediate left onto the ramp and into Lot 2. Purchase a parking permit at the gate and park in any unmarked space. Signage will guide you from the parking lot to the event. Shuttles will also be available to take guests from the parking lot to and from the event. There are no physical tickets for this year’s event. Guest names will be on a list at check-in upon arrival. Kids 12 and under are free with an accompanying adult and do not need a ticket to enter the event. We also have a dedicated area to help keep the kids entertained. What Is The Timeline For The Event?